MOUNT AIRY, NC—Steve Thomas, former host of the popular PBS series, This Old House (1989-2003), and Renovation Nation (2007-2009) on the Planet Green channel, is used to renovating challenging homes across the U.S. His most recent project, though, was exceptional for two reason: it was his own newly purchased 100-year-old adobe-style home in downtown Santa Fe, NM, and it was a mess. For help, Thomas turned to someone he met while filming the show in Santa Fe in the 90s: Aaron Lewis, with the local Santa Fe firm Southwest Spray Foam. Lewis and partner, Matt Segura, immediately got to work on the crumbling roof. They removed layer upon layer of tar, and the original roofing small “latillas”, aspen or juniper branches laid across wooden “vigas” or beams, and over 16 tons of dirt. They cleaned it, did extensive repairs to the roof deck then used 6 to 12 inches of spray foam insulation (SPF Insulation) by NCFI Polyurethanes, the U.S. company that pioneered spray foam insulation back in the 1960s, and not coincidentally the company that supplied the insulation for the This Old House episode in the 90s. Segura says, “He [Thomas] knows his building materials and building science, and he wanted the best for his home. NCFI is the best, so we used 3 to 4 inches of NCFI’s InsulStar SPF high-performance, closed-cell insulation on the new concrete slab floors covering radiant heat tubing, and 5 to 8 inches on the exterior of the walls. The SPF insulation was then covered with a one-inch layer of cementitious stucco colored to match the neighborhood.” Segura adds the InsulStar works so well Thomas was able to ditch his plans to install air conditioning. 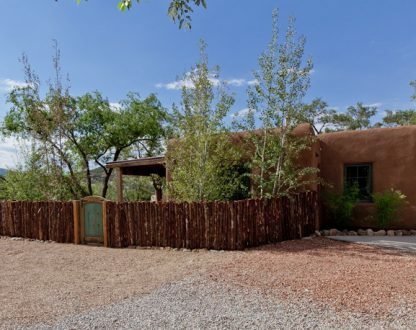 Thomas filmed a show in the 1990s in downtown Santa Fe and fell in love with the area, so when he, and his wife Evy Blum, wanted a place to escape the brutal winters of their home off the coast of Maine, they looked to Santa Fe. The couple purchased the crumbling adobe casita in the downtown area in the summer of 2012 then Thomas put his years of renovation knowledge to work, and brought in Southwest Spray Foam. Since the 1,200 sq. ft house had been built in stages over many decades, and modified many times, there was an assortment of materials to content with: adobe block, frame walls, and penitentiary block—ceramic block manufactured by prisoners at a local penitentiary in the 1950-60s. The aged block is notoriously brittle and difficult to work with. Not only were Thomas, Segura, and Lewis dealing with assorted building materials, they were also dealing with multiple structural designs. The house needed just about everything—new roofing, thermal protection, air sealing, waterproofing—to meet Santa Fe’s stringent code, and it all work had to be within the historic preservation zoning restrictions of the city and state. The height could not be raised, the interior height of the ceilings could not be changed, and the exterior style and color had to fit into the historical design guidelines. Plus, it had to be comfortable, energy efficient, healthy, sustainable and meet or exceed building codes. That laundry list was achieved with the use of InsulStar insulation, and the expertise of Segura, Lewis and Southwest Spray Foam. Santa Fe saves a piece of its history, and Thomas and Blum have a healthy, well-insulated place to enjoy their time in New Mexico.